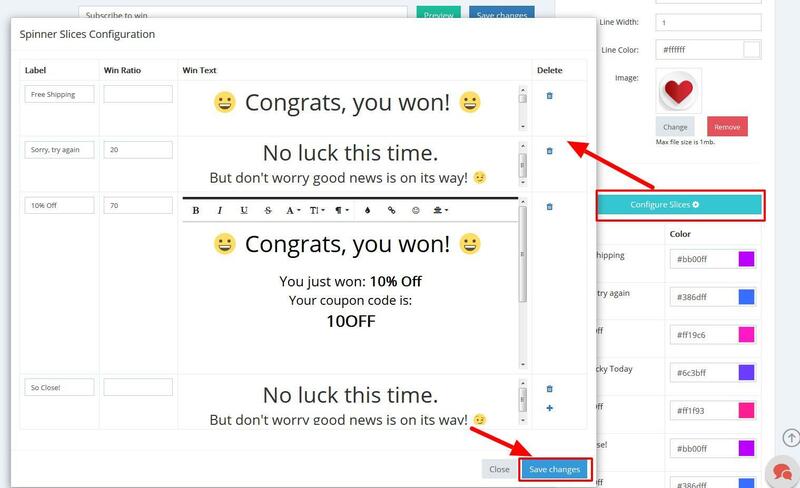 So you want to add a Spinner popup to your website to grow your sales? Popup Maker provides you with all the necessary tools to have an attractive and highly converting Spinner popup. Test Spin - Click on the "Test Spin" button to see the the spinner in action, before you attach it to a site. Show once after Spin - Specify the day after which the Spinner will be shown to the same user again. Note, that this setting refers the case if the user has spinned the wheel. If the popup opens but the spinner is not used, it will open again unless the user clicks to spin the wheel. Background Container - Set up the Width and the Height of the spinner contained. The spinner will stay centered when the container size is changed, in any way. Select a background Color for the spinner, pick any color needed to make it more attractive. Pointer - Select the position of the pointer, picking the Angle on the spinner. Change and pick the desired Color for the spinner pointer. Customize the contour color and the thickness of the pointer with Line Color and Line Width options. Spinner - Select the exact position of the spinner in the popup, moving the pointers of Position X and Position Y. You can control the spinner size with the Outer Radius option. Control and change the size of the inner circle of the spinner with Inner Radius option. Change the Text Font Size inside the slices of the spinner. Customize the contour thickness and the color of the slices in the Spinner, with Line Width and** Line Color** options. Select and upload a custom Image for the center of your spinner. Make sure the image size is not larger than 1MB. Click on the "Configure Slices" button to customize the slices inside your spinner element. A window will appear, where you can add and remove slices. 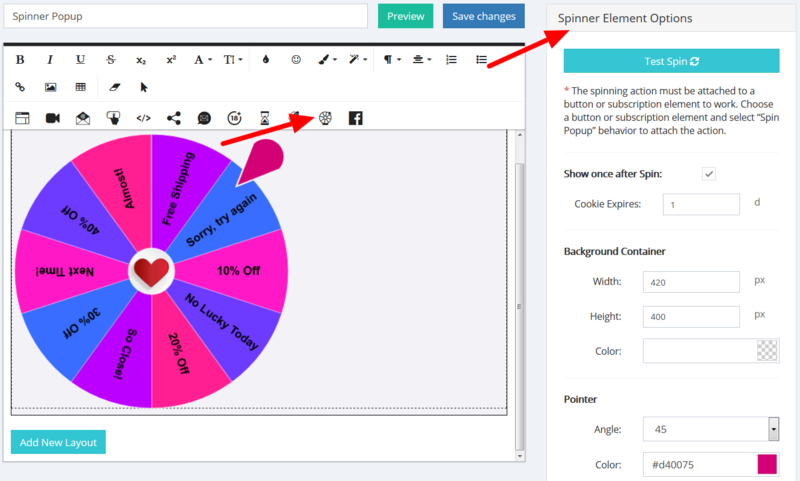 Label - Change the text of the name of each slice in the spinner. *Win Ratio - Here you set up the priority of the slice that will most probably win after spin. Here&apos;s how it works - the total amount of the Win Ratio numbers should be 100. The slice with a higher value will have a higher chances to be selected after spin. For example, if the Win Ratio of a slice is set "20", this means that this slice is 20% probable to be selected after spin. Don&apos;t forget to save the changes after you configure the slices. Here you can set up the color of each slice in the spinner.